OUR very own Border Post manager and Pyramids Rd resident Sam Wantling has been keeping a close eye on the blaze at Wallangarra as it continues to burn. 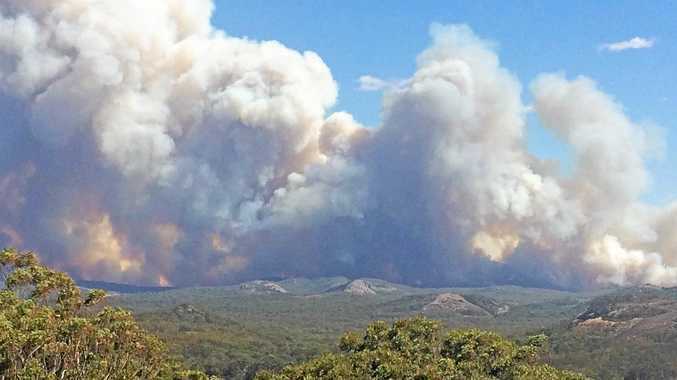 She's given a first hand account of what the scene looks like out that way with the fire taking off into Girraween National Park. How does it feel to have fire come this close? Any whisper of fire that hits Girraween always sends a little chill down your spine. The speed of a fire is astounding and even though it still has a distance to go, I know how fast fire can move with a little wind behind it. Since we have owned the property this is the third fire we have 'monitored' in our vicinity. We are lucky that it has never made close enough to our property to have to evacuate, but I'm guessing that is due to our local rural firies. How close does it have to get for you to leave? I really don't know. My husband told me today if that wind changes direction we are gone. So I guess it's not how close, but what the wind decides to do. Are you in touch with the fire brigade or just watching and waiting? At the moment we are just watching and waiting. I have complete confidence in our local firies. They know this region and the territory and the rural guys and the National Park rangers know how quickly a fire can turn in this country. We've owned the property for 11 years, but lived here full-time for 5 years. Is it under threat or are you feeling confident it won't get that close? At this stage I'm confident that it is travelling straight east and that keeps us out of danger, but if it changes to north-east then I guess my confidence will waiver a little.